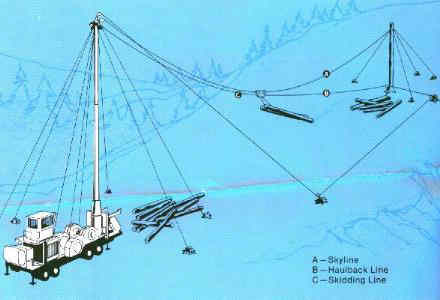 Shown here is a typical slack line logging rigging. Required are 3 lines--A skyline, a haulback and a skidding line. It varies from the gravity system in that the haulback is added for a power out on the carriage. This eliminates the necessity of having the tail hold below the tower. As with the gravity system the skyline is slacked in order to lower the carriage and permit the hooking, thus the name 'slackline'. This rigging system is favored in a number of conditions. It is usable in down hill logging and is favored in 'cross canyon' logging where the tail hold can be secured on the next ridgetop. A standard maximum reach is regarded as 2,000 feet for this rigging method, but with special long reach equipment and careful engineering greater distances can be reached, though not without extra expense and with reduced production. This system can produce full suspension logging, particularly across streams when rigged 'cross canyon' and most particularly in rugged steep ground. the skyline is lowered for hooking, but then when the skyline is raised, the logs go with it, may literally be hundreds of feet in the air in the middle of the span, depending on the depth of the canyon.